Utilizes ion exchange resin canisters for the removal of dissolved heavy metals from a variety of rinse water and wastewater streams. Evoqua Water Technologies Wastewater Ion Exchange (WWIX) services and equipment help customers meet their wastewater handling challenges. 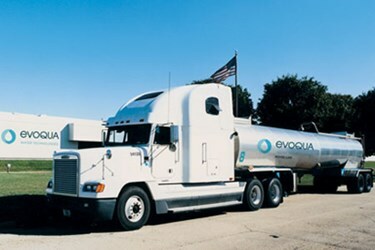 Evoqua provides system design, installation, and custom services that treat wastewater contaminated with heavy metals. Zinc, copper, nickel and chromium are just a few examples of the metals that can be removed to low part per billion levels. Our wastewater treatment systems are designed to meet your discharge requirements, achieve the water quality level needed for reuse and recycling and minimize the liability associated with on-site storage and handling of chemicals and wastes. Each application is examined to determine the system configuration that best meets current and future needs. The system components are selected based upon available manpower, space limitations, access limitation and the specific reuse or discharge quality required. If needs change, our wastewater treatment systems are flexible – we can simply change the media types and/or tank size saving our clients significant capital expense. Ion exchange (IX) is a proven and cost-effective technology for removing inorganic contaminants. Evoqua‘s WWIX service utilizes ion exchange resins and other media selected to remove specific ionic contaminants from groundwater, industrial wastewater, and process water for recycle. DOT approved vessels containing the selected resin or media treat your water until the capacity is reached. Once exhausted, the WWIX vessels are removed and replaced with fresh, DOT-compliant vessels and returned to service. Exhausted vessels are returned to our processing facility where the contaminants are removed from the media/resin. Your specific requirements are evaluated on an individual basis to determine the system configuration that best meets your current and future needs. The system components are selected based upon your specific reuse or discharge requirements. If your needs change, our wastewater treatment systems are flexible - we can simply change the media types and/or tank size saving you significant capital expense.